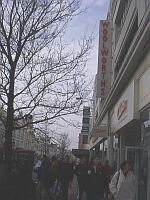 Woolworths in Western Road was the equivalent of the ‘5 and 10 cent stores’ in America. Here there was nothing over 6d (6 old pence). Sheet music became very popular, with the words and music of popular songs, and at the back of the store there was a long counter displaying them. A piano stood in the corner, and an assistant would play and sing any number you requested, while another took the money for it. Further along the road, near where C & A is now, there was a store called Staffords; quite a fascinating place where they sold ornaments and fancy goods, the sort not seen at any other shops. In the afternoons they held tea dances. There was a small charge for a cup of tea, sandwich and cake. You could either sit and watch or participate in the fox-trot, waltz and the quick-step. The music was provided by a piano and a violin. Further to the note on Staffords: there was a lift that you could take to the second floor where there was a sizeable dance floor and music was also supplied by saxophone and several other instruments. Wades was further along nearer the Clock Tower and was also a very large store that had an excellent restaurant on the second floor. Their ‘Visit Santa at the North Pole’ at Christmas time was superb. Oh happy days! I recall Woolworths in the fifties when it had creaky wooden floor boards and mirrored pillars at the end of the counters. I believe it continued with this image until the sixties at least. I once found a very old style Woolworths in a small town that still looked like this in the late seventies (it was like walking back in time) a few weeks later it was modernised. Staffords was not the old C&A store [now Primark] it was in the next block and you can see the large letter ‘S’ on some of the stonework outside. A friend told me that in the years before WWII they had a small single wing real airplane for sale on the first floor! It’s great to be able to walk around all three floors of the Woolworth’s building again, which you used to be able to do at Woolworth’s many years ago. My very first job after leaving school at 14, was at a Lipton’s grocery store, where my uncle, Thomas Bryant, was the manager. I was too young to work on the shop floor, so it was my job to pack all the food stuffs that had to be packed by weight, eg sugar, rice, peas etc. Good fun, but the shop cat hated me.